If OS X 10.7 Lion brought a major overhaul to Apple’s Mail email client, and OS X 10.8 Mountain Lion was more of a minor Mail tune-up, then Mavericks (OS X 10.9) gives Mail—now at version 7.0—little more than an email oil change. Still, the changes in Mavericks offer ways to improve your productivity if you use Smart Mailboxes, Passbook, and Notification Center. But they also add new challenges if you're a Gmail user. You can now include a specific account as one of the criteria for a smart mailbox: A new condition called Account lets you limit the smart mailbox’s searches to one of your configured accounts. Oddly, unlike with most other conditions, you can’t exclude a particular account as a condition, so if you want a smart mailbox that searches some—but not all—of your accounts, you’ll need to make a slightly more complicated set of rules. Held accountable: Fans of smart mailboxes will be thrilled to find a couple new enhancements, such as the capability to limit smart mailboxes by account. If you’ve got multiple smart mailboxes inside a folder, those folders are themselves smarter in Mavericks Mail. In OS X 10.8, selecting a smart mailbox folder showed you a blank pane where the message list usually appeared; in Mavericks, you instead see a list of all the messages contained in all of that folder’s smart mailboxes. Mail 7.0 also has new Notification Center email alerts. Assuming you’ve configured Mail’s notifications to display banners or alerts (in the Notifications pane of System Preferences), you can now perform some useful actions right in the notification. Trust, but notify: Email notifications now let you delete or reply to a message without switching to Mail. The key note: You can now search by attachment type, making it easier to find all those presentations in your email. In OS X 10.8, you could search messages for the name of an attachment, but in Mavericks, you can search by type of attachment. For example, to find messages with Keynote documents attached, type key in Mail’s Search field, and then click Keynote Document in the Attachments category at the bottom of the suggestions list that appears. The list of results will show only messages with Keynote attachments. 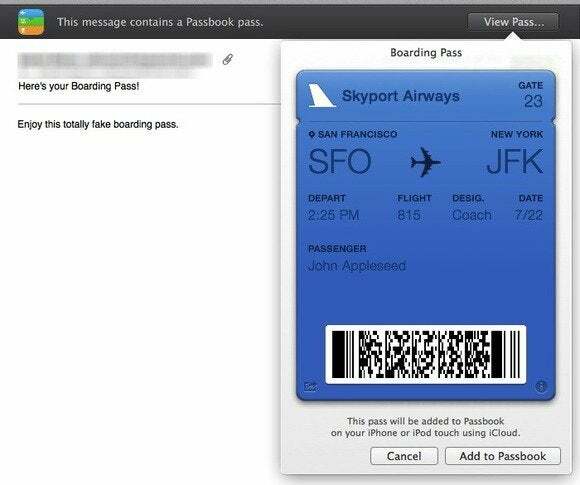 Mavericks now includes partial support for Passbook passes, letting you view emailed passes on your Mac. When an email message includes a Passbook pass as an attachment, a dark bar with the Passbook icon appears at the top of the message, noting, “This message contains a Passbook pass.” Tap the View Pass button to get a quick preview of the pass. Tap the i button to get more info about the pass; tap the Share button to send the pass via email or Messages. If the pass has expired, the bar code on the pass is dimmed. 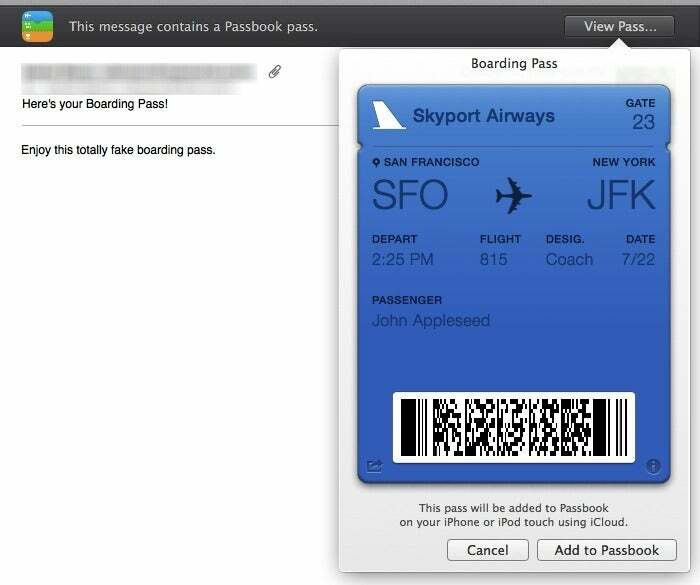 Pass go: Mavericks boasts tighter integration with Passbook, allowing you to view and add passes right from Mail. Using the new search features in Mavericks’ Mail, you can also quickly search for Passbook passes you’ve received via email. Just type pass in Mail’s Search field, and then click one of the searches in the Attachments category at the bottom of the suggestions list. Alternatively, you can search for coupon for coupon passes, or simply type a company name to find all messages—including passes—from that company. As with most major updates to OS X, Mavericks brings a number of minor changes to Mail’s settings and menus. In the General screen of Mail’s Preferences window, you’ll find a new option in the ‘Check for new messages’ pop-up menu called Automatically. This option essentially allows Mail to support push-style message retrieval—you receive new messages immediately, rather than at the next scheduled check. Automagic: Digging around in Mail’s preferences yields a few new options, including the capability to have Mail check for messages automatically. In the Accounts screen, you can no longer edit the password for your main iCloud account—that setting is now accessible only in the iCloud pane of System Preferences. In the Advanced tab of the Accounts screen, a new ‘Automatically download all attachments’ option does just what it says on the tin: It downloads all message attachments as messages arrive. In the Viewing screen of Mail’s preferences, you’ll notice that OS X 10.8’s ‘Show online buddy status’ option is gone—Mail no longer integrates IM buddy status. Similarly, in the Composing screen, OS X 10.8’s ‘Automatically complete addresses’ option is gone. This is because Mavericks always autocompletes addresses—there’s no option to turn it off. Import-export business: A new ‘Export as PDF’ option in the File menu makes quick work of creating PDFs from mail messages. A new File > Export as PDF command saves the selected message(s) as a PDF document. This command does exactly the same thing as choosing File > Print and then choosing the ‘Save as PDF’ option from the Print dialog’s PDF pop-up menu, but with fewer steps. In the View menu, Message Attributes > Buddy Availability is no longer an option because, again, Mail doesn’t integrate IM buddy status any more. (Similarly, if you use the Customize Toolbar command, Chat is no longer an option for a toolbar button.) Under View > Sort By, if you choose Date, the sort-order options are now more understandable: Instead of Ascending and Descending, they read Oldest Message On Top and Newest Message On Top. Finally, in the View > Message submenu, the only options are now All Headers or Raw Source. In 10.8, there were options for Plain Text Alternative, Previous Alternative, Next Alternative, and Best Alternative. Alas, not all of the changes to Mail in Mavericks are entirely positive, particularly if one or more of your email accounts is a Gmail account. Mail and Gmail have never played particularly well together, in large part because Mail treats Gmail as an IMAP account, and the way Gmail implements IMAP is pretty poor. But in Mavericks, the situation is quite a bit worse. Macworld senior contributor and TidBITS senior editor Joe Kissell lays out all the details—too many to get into here—but the gist of the situation is that because of changes in how Mail handles Gmail accounts, you may find that the first time you launch Mail under Mavericks, Mail re-downloads all your Gmail messages, which could take a very, very long time if you have a lot of archived email. In addition, sometimes Mail simply doesn’t show messages that the Gmail website and other email apps (such as Mail on your iOS device) do show. And if you use AppleScripts to process email messages in Mail, there’s a good chance those scripts won’t work on your Gmail accounts in Mavericks. Joe explains a number of other issues relating to Mail’s Gmail changes, and provides some suggestions for dealing with Gmail accounts. We hope that Apple will fix these issues in the inevitable OS X 10.9.1, which, if history is any indication, should arrive in the next few weeks.